Me: Is it still ironic if naturalism is defined in terms of what we are justified to believe exists, rather than what we believe actually exists? Me: I assumed the irony was because the naturalist was asserting the non-existence of non-physical things. Are you saying that the faith is in the superiority of empiricism? I think that there is an inductive argument to be made for the reliability of empirically based ontological claims versus non-empirically based ontological claims. RR: I’ll still ask what justifies that belief. You need to spell out the argument. P1: the credence assigned to an ontological claim is rational to the extent that the credence is in proportion to the reliability of the claim. P2: ontological claims with higher degrees of empirical reliance have consistently demonstrated proportionally greater reliability, in both degree and frequency, throughout the course of history. P3: empirical observations are describable by natural science, so that the degree of empirical reliance for an ontological claim is proportional to the extent to which it can be described by natural sciences. Conclusion: it is only rational to assign credence to ontological claims in proportion to the extent to which it can be described by natural sciences. RR: I assume you think realism (as opposed to idealism) is justified? In what sense is it justified by way of reliability? Me: Realism requires the least amount of information, so it’s more probable in Bayesian terms, and Bayesian probabilities are ultimately reliable by way of empirical confirmation. RR & JT: I disagree. Idealism is simpler. There are fewer entities. Me: We need to consider the total amount of information, not the number of different entity types. The perceptual information includes realism (the ontological status of our self and other entities). It takes additional information to posit that realism is an illusion, and this additional information is not included in our perception (not empirical). gq: It seems we all agree that realism is “justified as being a properly basic belief”. Me: My acceptance of realism over idealism may be properly basic in practice but I think it is actually probabilistic, as argued above. gq: Even Bayesian justifications rely on “properly basic beliefs”. For example, the reliability of memory. Me: As one who leans toward pragmatism and coherentism, I initially accept the reliability of our cognitive faculties at face value and proceed to look at the study of their reliability to recognize the conditions under which they are more and less reliable, and I use the whole body of data to inform the assessment of reliability without getting hung up on the need for a definitive, indubitable foundation. Regardless, even if we define something in there as requiring faith, I don’t see that this is sufficiently analogous to the religious articles of faith to warrant the claim of irony. This is almost certainly biased toward doing a better job of summarizing my arguments than the arguments of my interlocutors (I’m noticing a lot more green than black), but there’s a lot more detail in the original conversation if you want to go deeper. Me: I would suggest that it is more appropriate to frame any adversity as being tied to their group identity rather than to one particular belief. SoT: Why believe the disciples faced adversity merely because of their group identity rather than because of their proclamation of the resurrection, and what is there to say that their belief in the resurrection did not become a central part of their group identity? Me: I’m not suggesting that the group identity did not include a belief in the resurrection. Rather, I’m suggesting that the “die for lie” apologetic is an exaggeration. Some reasons to think that “group identity” better relates to the adversity than “resurrection witness” include: historical precedent in general, Jesus’ crucifixion as evidence of pre-existing conflict, Paul does not cite the witness as a reason for his pre-conversion activities, Acts does not focus on the witness in the relevant narratives, and Tacitus cites the eucharist as a motivating reason (though it doesn’t apply to the disciples). SoT: The fact that they persisted in that group identity following Jesus’ death is best explained by their conviction in having witnessed the resurrection. It is pretty clear that this belief was a key part of their group identity after Jesus’ death. Me: The point is that we can’t boil their identity, and the corresponding conflict, down to a single belief. We should acknowledge that there are many factors – belief in the resurrection included – which contributed to the continuance of the group identity and the conflict with other groups. SoT: If the resurrection belief did not originate in a first-person experience, why did the disciples claim it did? Group identity as a motivating force can certainly explain some of the adversity they faced and some of their persistence in the face of that adversity, but to me it seems far from sufficient. And we have no evidence for any origin of the belief in Jesus’ resurrection aside from the first person experiences of the disciples. 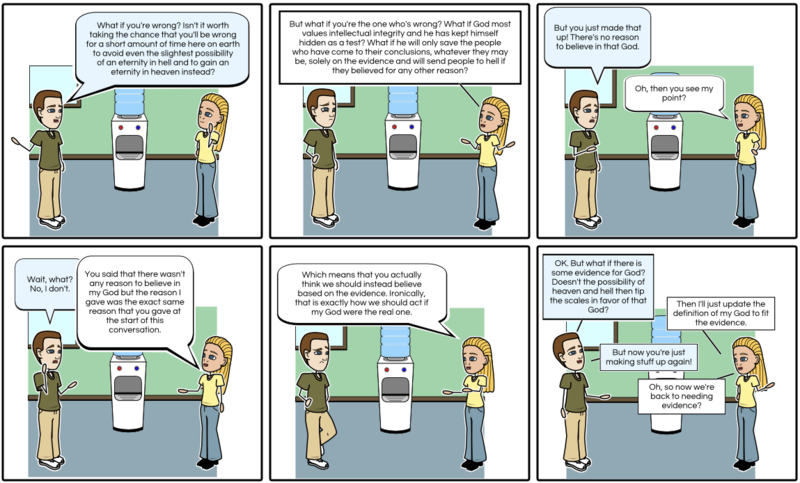 Me: I think it’s fair to suppose that the group’s belief in the resurrection contributed to adversity (in accordance with prior comments), but it is very different to claim that this requires physical, first-person experiences.I don’t think the gospels and 1 Corinthians 15 are incompatible with accounts that did not originate with the disciples, and even if we grant that they originate with the disciples, there is still the possibility of invention, retrospective mistaken identity, confabulation, or hallucination (or a combination of these). SoT: To be more precise, the inference is from the willingness of the disciples to face adversity for proclaiming that they had witnessed the resurrection, not just from the fact that they faced adversity for believing in the resurrection. I am skeptical that something less than a powerful experience could have changed the disciples and caused the early Christian movement to grow the way it did. Me: I agree that there is in the tradition some evidence that the disciples claimed witness to a resurrected Jesus. However, the phrasing of the argument asserts a very specific, exclusive relationship that is too narrow and overlooks all the other factors at play, so that the relationship is exaggerated. And there was no leaving or returning to Judaism. This was Judaism. The introduction of the belief in Jesus’ resurrection was more a revitalization than a change. These followers had already committed their lives to this group identity, and the drive to maintain that identity is a potent force. SoT: I don’t think it is so narrow as you say, because to me it seems the force of the other factors would be significantly reduced in the absence of the resurrection experiences, so that the other factors are not sufficient to explain what happened. In the aftermath of Jesus’ death, why would the disciples continue to think that they had the true Judaism, when their Messiah had just been killed? Their group identity was “Judaism but done right” and doubt gets cast on the “done right” part by their leader’s death. Me: This group was previously organized around a message that included more than Jesus’ messiahship, which is sufficient to serve as the glue that supports the resurgence that comes with the resurrection belief. They all didn’t simply drop their heads, turn around, and go their separate ways. That said, I’m also inclined to believe that the resurrection belief was a relatively early introduction, and that if it had not been introduced, the group would probably have been a minor footnote to history – much like the Mandaeans. The resurrection belief, coupled with the parousia, renewed their eschatology without having to change their chosen one. SoT: I disagree that the group identity could have been as strong if the resurrection belief came from some other source than eyewitness experience (and I remain doubtful about the plausibility of that belief arising from any other source as well). It isn’t just the belief in the resurrection, but their experience of seeing Jesus risen that motivated the disciples. Me: The “die for a lie apologetic” is typically drawing on the improbability of persons facing severe adversity for the sake of something they knew to be false. The version of the argument summarized in the previous comment is claiming that it is improbable for persons to be in a state in which they are willing to experience adversity, unless they were brought in to that state through direct, first-hand experience. I find that history and psychology shows that this is not at all improbable. There was also a bit of a side thread where I questioned how he viewed Luke-Acts placing all post-resurrection events in Jerusalem while Matthew (and the hint in Mark) place everything in Galilee, and the likelihood that John 21 is an addition. We didn’t pursue that very far, but I think that a more critical review of the text does not support the notion that there was a strong tradition underlying the post-resurrection accounts in the gospels. As before, I tried to be fair but this is still probably biased toward more accurately summarizing my arguments. Regardless, I’m interested to hear any other thoughts on the ideas shared in these two discussions.